This morning, Ryan and I tag-teamed breakfast. Ryan got Sagan situated in his chair with a inventory of cereal and berries. Then when I got my groggy rear downstairs, Ryan ran back upstairs to shower. I made myself some oatmeal and strawberries, grabbed some soy milk, and sat down next to the little boy who immediately put his spoon down and started to enthusiastically point. “TREE! TREE!” he shouted proudly. He was very clearly pointing right at…ME! Well, I may start the 3rd trimester tomorrow, but I’m not definitely not THAT big, at least not yet, so I was a little confused. It turns out I had slept in a shirt from the American Chestnut Foundation. Only I had put it on backwards (Hey, I’m not superwoman. I can’t mother, work, and be bothered with frivolous details like what direction my clothes are on. Hehe). As a result, a beautiful botanical drawing by artist Bruce Lyndon Cunningham was on my chest. With that, we resumed our breakfasts and had a most delightful Friday morning. It turns out, she fancied a man who did not share her affection. He explained in simple, albeit blunt, terms why. But she took that moment and used it as motivation. Even though months have passed and our gym is now a whole 17 minutes further away, I still see her occassionally. Still focused, still working hard. I’m currently pushing 27 weeks with my second pregnancy. The other day I was indulging in a shower (motherhood has definitely increased my appreciation of a good, long shower). As I bathed, I found myself singing a number of 60s tunes that reminded me of my deceased father. And then I remembered how around this time last pregnancy, there would be mornings where I would go downstairs and he would be in the kitchen cooking sausage or bacon or other red meat temptations. He would look at me and greet me with, “You’re getting faaaat!” I think at the time, I laughed politely, but it’s not exactly what a pregnant girl wants to hear. But this week, nine months after his death, when I got out of the shower, I noticed my increasing girth in the mirror (it’s kinda hard to miss these days 🙂 ). I thought of my father getting that infectious smile of his and those mischievous wrinkles around his eyes. I thought about him calling me fat and this time, I could clearly see his underlying excitement of what that actually meant– a new grandson. Like that woman at the gym, I too found surprise happiness in being called fat. He could give his mother a hug. “He chose to take out the trash!” my friend laughed. I knew it was coming, but I thought with a 20 month old son, I had a good decade or so before I would encounter such a snub. Nope! 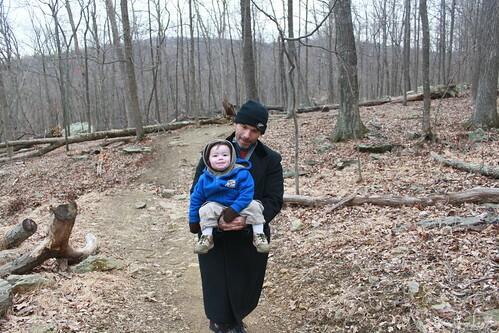 Last month for my 38th Birthday Hike, our little family drove up to Catocin Mountain Park. 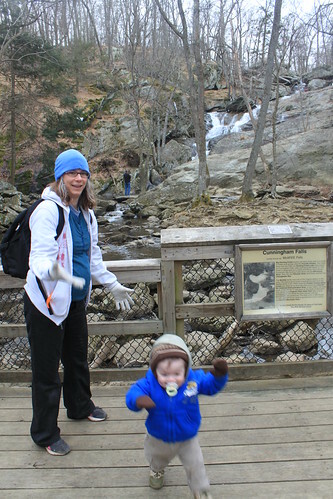 We parked at the Visitors Center and hiked 1.4 miles to Cunningham Falls, which at 78-feet is the largest cascading falls in Maryland. Sagan was patiently indifferent to the first 1.2 miles. He did some walking, but for the most part hitched a ride. When we reached the final approach to the falls, however, Sagan found his passion. That last 0.2 miles was a boardwalk and he LOVED running back and forth on it. YEAH! Now this is where the fun is at! See ya, Mama! I have places to go! To be honest, it was rather worth it to see him have so much fun. After some more exploring the boardwalk, we hiked back to the visitors center and indulged in some yummy yummy Cracker Barrell on the way home. All in all, a most excellent day! 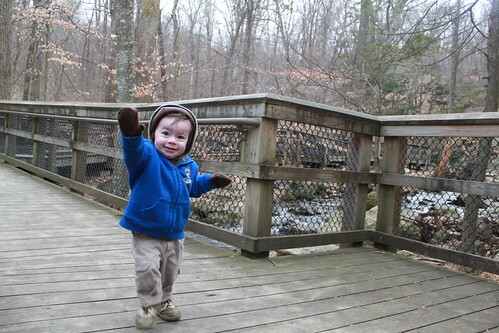 More pictures of our hike to Cunningham Falls can be found on my Flickr site.